Canyoning is the mother of all recreational sports, because in many cases you will end up using a variety of other recreational sports, hiking, trekking, scrambling, climbing, technical swimming and even diving, and the most important part is the technical rope use. A lot of technicality needed to provide a special, but safe experience. The rush of adrenaline, a mix of thrill and pushing ourselves to the limit, even reaching to new limits we never knew that we were able to reach is what makes the canyoning experience a great Adventure, and with the addiction to the adrenaline rush, the need will be always for a bigger dose, though every time a canyoneer will look for a bigger challenge in which -same as all other recreational sports- he will challenge himself before challenging anything else. 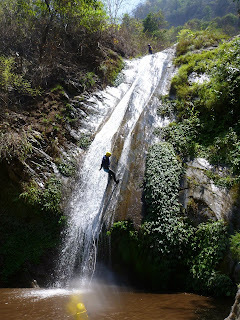 Canyoning usually happens in areas isolated from human access, either for being far from civilization or for its hard terrain that makes it hard for access for none expert. But in the same time this is what gives it the feeling of wilderness, a feeling to be where no man been before. Once inside the canyon, surrounded by its high walls, with the sound of water making a lyre of isolation that blocks all other sounds around, one can feel the joy of the wilderness, the satisfaction of his need to be back to nature. Even with being the mother of recreational sports, Canyoning on the other hand have a lot of hazards on the Canyoneers as well as on the canyon itself. If not practiced with extra care, canyoning hazards can be irretrievable, and on the worst cases can cost a life. Here in Jordan for example, we all heard the shocking news lately about the accidents that happened in Wadi Zarqa Maen, in less than a month 3 accidents cost ended of the death of 5 people, the newspaper will have every now and then a news about canyon accidents, "The civil decadence evacuate 1 person after suffering of a bad fraction on leg during abseiling from a water fall in Wadi Karak", "A tourist been evacuated by Helicopter from Wadi Karak after suffering a bad injury"," A student past away after getting stuck in the Mujeb Water", and many many other shocking news. But the question here “Can’t this be prevented?" I will try to answer this question through this article and the coming few articles. What I believe many of these accidents could have been avoided, or at least minimize the effect of it, if people were aware of the right practices to avoid it, or at least of how to handle such situations if it happened, because no matter how expert the person is the accidents can still happen in this environment because we don't have the total control on it. But in the other hand an expert will be always ready to face these accidents. with the growing access to these places by organized and none organized groups, more accidents will happen if there is no control or awareness for the groups and individual actions. And with many, many groups appear on the internet and on the social websites that advertise themselves as Adventure Experts, and with the lake of applied laws that cover such kind of activities, it become the tourist and only his responsibility to decide which group, guide, and canyon to go with, which group are safe enough and practicing a high standers of safety and natural awareness. Though i believe it is important for all to understand how can they differentiate between different groups and have an understanding eye on their practices. Also these articles supposed to help the tour operators to know what to look for to provide better reliable services for their guests. In the next Article i will talk about the important of having a code of conduct for canyoning and how can it help to prevent accidents and provide a better experience.